Image: MileA/iStock/Getty Images Plus/Getty Images, Yin Yang/E+. Design: Ashley Britton/SheKnows. You’ve got the turkey on the table along with all the fixings, the candles are lit, and your friends and family are gathered around. You’re missing just one thing: music in the background to enjoy while you eat — a feast for your ears. But don’t worry. We have you covered. Here’s a playlist of some wonderful Turkey Day songs that will warm your heart just as much as eating gravy while surrounded by your loved ones does. We’ve found some classics, some traditional Thanksgiving songs and some more contemporary choices that everyone will enjoy, from your great grandma to your brand-new niece. And if Uncle Gary brings up his very special thoughts about the latest political controversy, we invite you to turn it way up. Why not start off with something sweet? This horn-filled classic by the late, great Ray Charles is about both dessert and love, and it’s a total crowd-pleaser. A lot of people complain that the worst part of Thanksgiving is having to hang out with relatives with wildly differing viewpoints. And while you shouldn’t have to put up with intolerance and hate, we love this folksy song by Dar Williams because it’s about sitting down at the table with people who are different from you and connecting with them as best you can. Here’s a classical hymn to throw into the mix — we love this simple piano version. It’s a great melody, and it’s about what Thanksgiving should really be about: coming together. We love this 2009 folk-rock pop song by Edward Sharpe and the Magnetic Zeros that’s all about home: both literally and figuratively. And yep, there’s a pumpkin pie reference in there. Lighten up the mood with this classic from Adam Sandler’s 1993 classic comedy album, They’re All Gonna Laugh At You! Slight content warning: This does have some mature material in it, so you might want to wait until after Grandma goes home and the kids go to bed to spin this tune. Slow things down with some laid-back reggae by music icon Bob Marley. This track off of 1983’s Confrontation, has a Rastafarian theme but echoes the central beliefs about Thanksgiving: being grateful for what we have. This is a good sincere one — and a good bridge from Thanksgiving to Christmas — from legend Mary Chapin Carpenter. Settle in for another epic Thanksgiving Day song, this time by singer-songwriter Dan Bern. It really captures the feel of Thanksgiving, both good and bad, and it clocks in at just over 10 minutes, which is just about how long it takes to fully carve a turkey, so why not? Here’s one from 1930s jazz singer Cab Calloway that is just totally, completely and 100 percent about food, and we love that about it. Whether you’re having Thanksgiving with your actual family or Friendsgiving with your chosen family, this song belongs on any Turkey Day playlist. This one’s kind of deep. By singer-songwriter Loudon Wainwright III, it contains his trademark confessional, honest and sometimes humorous lyrics paired with a simple folk tune. And it really captures the feeling of spending Thanksgiving with your family. Has indie rock band The National performed a song about gravy boats? Yes. Yes, they have. And it is totally awesome. Let’s be real: when you wake up on the day after Thanksgiving, you’re not going to be eating eggs. 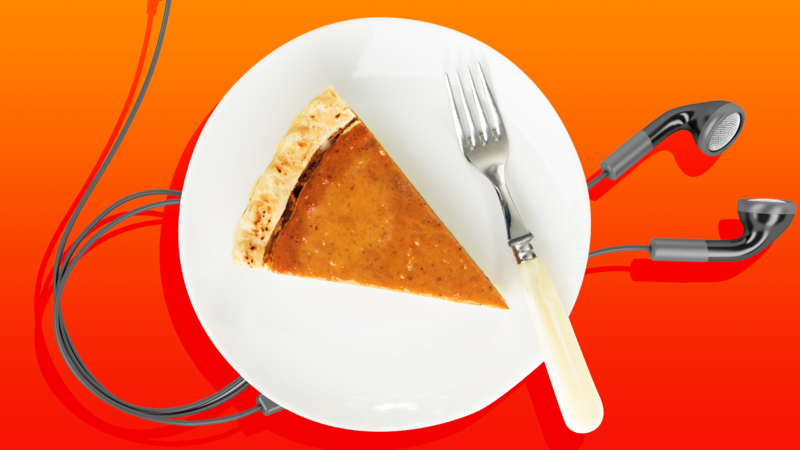 No — it’s way more likely you’ll reach for a cold piece of pie and a hot cup of coffee. This charming folk song captures that greatest of feelings: eating pie for breakfast the day after Turkey Day. This epic narrative folk song from 1967 tells the comedic story of Arlo Guthrie getting arrested for littering on the day after Thanksgiving in 1965. At over 18 minutes, it is an investment. But for many families, it’s as much a Thanksgiving tradition as the turkey. Try playing it after you serve the pie.